This a Narrative Field that is visible on all three levels for Addiction Professionals listings. It allows up to 500 characters. A Swiss psychiatrist and psychotherapist who founded analytical psychology. Jung proposed and developed the concepts of the extraverted and the introverted personality, archetypes, and the collective unconscious. His work has been influential in psychiatry and in the study of religion, literature, and related fields. Carl Gustav Jung was a Swiss psychiatrist and founder of the school of analytical psychology. He proposed and developed the concepts of the extroverted and introverted personality, archetypes, and the collective unconscious. The issues that he dealt with arose from his personal experiences. For many years Jung felt as if he had two separate personalities. One introverted and other extroverted. This interplay resulted in his study of integration and wholeness. His work has been influential not only in psychology, but in religion and literature as well. Jung was born on July 26, 1875 in Kesswil, Switzerland, the only son of a Protestant clergyman. At the age of four his family moved to Basel. His childhood was a lonely one. Jung observed his parents and teachers and tried to understand their behavior, especially that of his father. The elder Jung had a failing belief in religion. Jung could never understand why. There were numerous relatives on either side of his family that were clergymen. It was expected of Jung to continue in the family tradition. Jung did not decide to follow, choosing instead to attend the University of Basel from 1895-1900. Before deciding to pursue medicine Jung studied biology, zoology, paleontology, and archaeology. His explorations did not stop with that, he looked at philosophy, mythology, early Christian literature as well as religion. His interest in religion could be attributed to his heritage as well as watching the demise of his father. After leaving Basel, Jung became an assistant physician at Burgholzli Psychiatric clinic under Eugen Bleuler. In 1902 he obtained his M.D. from the University of Zurich. His dissertation was entitled "On the Psychology and Pathology of So -Called Occult Phenomena". Through this work one of his basic concepts is outlined, the underlying wholeness of the psyche. Jung's first research was conducted in 1904. He studied word association in patients. He found groups of repressed psychic content for which he invented the now famous word "complex." This study brought him close to the work of Sigmund Freud. Jung's work confirmed many of Freud's ideas. Between 1907 and 1912 he and Freud worked very close. Many believed that Jung would continue Freud's psychoanalysis, but this did not occur. Over temperamental and differences concerning the significance of sexuality in human life, the two split. Jung contested Freud's analytic principles, which he claimed were one-sided, overly-concrete, and personalistic. Their relationship was finished forever when Jung published "Psychology and the Unconscious" which argued against some of Freud's ideas . In 1912 "Symbols and Transformations of the Libido" was published. Jung wanted to understand the symbolic meaning of the contents of the unconscious. In order to distinguish between individual psychology and psychoanalysis Jung gave his discipline the name "analytical psychology." 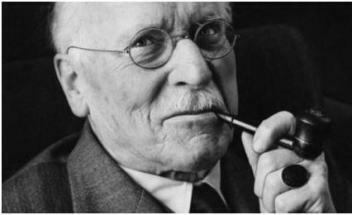 After a break with the start of WWI, Jung wrote the book "Psychological Types". It set the differences between his position and that of Freud. Jung became more interested in the study of mythological and religious symbolism. His studies took him across the globe where he observed many different cultures. He was interested in tracing the analogies between the contents of the unconscious in Western man and the myths, cults, and rituals of primitive peoples. Jungian therapy deals with dreams and fantasies. A discussion is set up between the conscious and the contents of the unconscious. When the therapy works the patient enters an individuation process. This consists of psychological transformations ending in the opposite tendencies working together to achieve personal wholeness. Jung's total amount of work is very large. It is estimated that he authored 200 papers. An edition of his Collected Works in English was completed in 1972 by the Bollingen Foundation in New York and Routledge and Kegan Paul in London. This is an additional Comment HTML container with the same properties as The Profile HTML container above. We have not included the categories as we don't wish to annoy Google or other search engines.